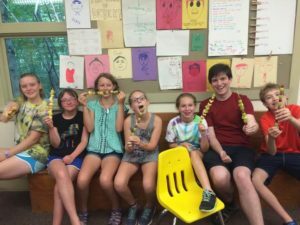 The School in Rose Valley runs a summer camp program on its 9 ½-acre wooded campus in Rose Valley, Delaware County, minutes from Media. Children ages 3 to 14 attend the camp. We have four programs at camp: preschool for children who are 3 and 4 (part-time options are available); 5 & 6’s, the general program, and the Counselor-in-Training program. Counselors work in pairs or teams and have a wide variety of experience, skills and talents. One thing they all share is a genuine love for and understanding of children. Counselors are responsible for creating and leading activities that engage and entertain the children, and for creating a sense of community within the groups and the camp overall. Summer Camp runs for 7 weeks, starting the third week in June, and regular camp hours are 8:30 to 3:30. There is also Extended Care available for children as early as 7:30am going as late a 6pm. After the seven-week season, there is an optional week 8, “Free to Be” week, which runs the second week of August, with fewer campers and counselors. The staffs’ hours are 8 to 3:45 daily, with a weekly staff meeting. Camp days are divided into seven 45 minute “innings” per day; there is a 45 minute lunch/quiet time period and time at the beginning and end of each day with the homebases. July 4th is a holiday. There is a mandatory day of training for all new staff members and the entire staff has a day of orientation and set up before camp begins. We have two pot luck suppers and variety shows for campers and their parents in the evening. We have a “camp over,” overnight camping on campus for the older campers. Counselors are expected to participate in these activities. Counselors also write a note to each camper in their group before camp begins. The last day of camp, we pack up the rooms and put our materials and equipment away in the storage shed. All counselors must have State Police and FBI Criminal Background (and Child Molestation checks.). We have the necessary paperwork for those who have not had these background checks performed. Time Table for Applying – If you are interested in applying for a job at camp, please send a cover letter and resume to: Mary K. Miluski, SRV Summer Camp, 20 School Lane, Rose Valley, PA 19063, or an email expressing your interest to: maryk@theschoolinrosevalley.org. The hiring process starts in January, interviews are traditionally conducted February through March with hiring decisions being made in April. Positions and Availability – We have specialty and general counselors as described below. We hire qualified people ranging in age from 15 to 50+. Various positions are described below. Availability varies from year to year depending upon enrollment and which former staff members return (usually about 75% return). For staff working with children the General Program (ages 7 to 14), in addition to leading your activities, you will also be responsible for a group of campers (usually between 10 and 20 children, mixed gender and grouped by age). You will have a homebase, a classroom at the school where you will meet with your group in the mornings. You will help your campers choose their activities for the day. You will be with your group at lunch and again at the end of the day. At the end of the day, the campers should help you straighten the room, take the compost (fruit and vegetable scraps) to the compost near the garden and ready the room for the next day. You will either have a partner or the assistance of a junior counselor. You will also be responsible for incorporating CITs into your activities at certain times and they will also look to you for guidance. All of the Guards/Swimming Specialists work together under the Head of the swimming program who makes up the swim groups, organizes the pool schedule and puts together the lesson plans. Each child at camp has a daily swim period (“inning”). Children are grouped together by age/capability. About half of each inning is used for age-appropriate instruction and the remaining time for free play in the pool. Preschool counselors also come to swimming with their campers and CITS may also assist with preschool swim. Swimming lessons are geared to the various ages and takes into account that some campers are with us for all 7 weeks while others are here for only a week. On rainy days, the activities will be inside and can range from games which incorporate water safety skills to board games. Most of our swimming specialists are also Red Cross certified lifeguards. All pool staff members are responsible for the children’s safety while they are at the pool, perform the daily maintenance at the pool, and record the data related to the pool. Most also work an afternoon or two a week at Extended Care and may teach private lessons to campers after normal camp hours, for additional pay. Create, organize and lead athletic age-appropriate activities, focusing on building skills, self confidence and sense of fair play. The focus of the activities should be on team-building, non-competitive games such as New Games. We have a field which can be used for soccer, touch football, softball, tennis softball, capture the flag, etc. The activities you plan should be geared to the various ages and take into account that some campers are with us for all 7 weeks while others are here for only a week. We usually have two Sports and Games Specialists who work together, and may or may not have a junior counselor. There are one or two Pre-school groups. Children can sign up for 5 full days, 5 ½ days or 3 full days per week. There are three or four counselors working with each group depending on the number of children in each group. Campers are three and four years old and must be potty trained. Half day children go home at 12, and everyone has lunch before the half day ends. The children who stay for the whole day have nap/rest time after lunch. Your children will swim in the morning, will have periods of time in the Woodshop, and will be invited to the camp-wide celebrations on Friday afternoons. Preschool counselors accompany their campers to the pool, woodshop and Friday celebrations. The Preschool leads are responsible for planning the daily activities (arts & crafts, games, walks in the woods (if you chose), stories, big group projects (such as making a collage), outdoor and indoor play0, and managing junior staff members. We have sand boxes, climbers, a play shed, and swings. (See “For All Homebase Counselors” above for further details.) We have an adult/teacher parent head counselor for each group, as well as college students and/or high school students counselors. General Counselors have homebases of campers and lead a wide variety of activities, not limited to a certain genre. Examples of activities include cooking, hiking, making and playing games, outdoor play, trust games, etc. General counselors work in pairs or with a junior counselor. Junior counselors are high school students who work with and assist senior counselors, specialists or generals. Many of our junior counselors are former SRV campers and CITs. Hiring starts in January and is ongoing. Interviews are scheduled in February – March and hiring decisions are made in April. The School in Rose Valley is an equal opportunity employer and hires without regard to gender, race, color, national and ethnic origin, and religion.